This has been a busy month for me. It was the month of two cataract surgeries, but I won’t be able to get the needed glasses for reading until about the second week of January. With each surgery it takes about two days to get over the dilation and do any serious reading and computer work. I want to share a photo of the beach and Mediterranean Sea at Ashkelon. The city is in the news this week due to the conflict between Israel and Gaza. Ashkelon is the closest Israeli town to the Gaza Strip. The LORD spoke against the Philistine cities through the prophet Jeremiah (ch. 47). These verses caught my attention. This photo of two children was made at the Nazareth Village (a nice place to visit). Children at the Nazareth Village. Photo by Ferrell Jenkins. All four Gospels and the book of Acts make a reference to Nazareth as the place where Jesus lived in his early years. This one from the Gospel of Luke is set at a time when Jesus was about 12 years of age (Luke 2:42), and before He was 30 (Luke 3:23). CNN has a report on the use of satellites to help unearth ancient Egyptian ruins. Read the full article here. The report features the work of Sarah Parcak, an archaeologist at the University of Alabama at Birmingham. In our society we tear down anything that is a decade or more old in order to build a new structure. Except, of course, for our historical districts. It wasn’t that way in the ancient world. If a structure was destroyed or ravaged, the conquerors might build a new one in the same place. They would build over and utilize any walls still standing. Building in ancient Egypt was along the Nile River and in the Delta. Much of what shows as Egypt on a modern map is not currently habitable. Eighty two million people live in this small space, according to the CNN report. When I took my first group to Egypt in 1967 we were told that the population was 40 million. Even then it seemed crowded; now it is terrible. In this field, Parcak is a pioneer. Her work in Egypt has yielded hundreds of finds in regions of the Middle Egypt and the eastern Nile River Delta. Parcak conducted surveys and expeditions in the eastern Nile Delta and Middle Egypt in 2003 and 2004 that confirmed 132 sites that were initially suggested by satellite images. Eighty-three of those sites had never been visited or recorded. In the past two years, she has found hundreds more, she said, leading her to amend an earlier conclusion that Egyptologists have found only the tip of the iceberg. “My estimate of 1/100th of 1 percent of all sites found is on the high side,” Parcak said. 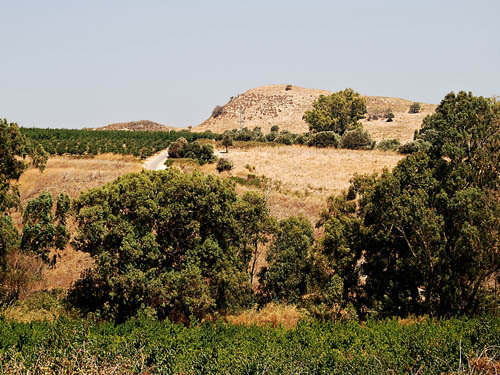 “We can see patterns in settlements that correspond to the [historical] texts,” Parcak said, “such as if foreign invasions affected the occupation of ancient sites. “We can see where the Romans built over what the Egyptians had built, and where the Coptic Christians built over what the Romans had built. The flooding and meanders of the Nile over the millennia dictated where and how ancient Egyptians lived, and the profusion of new data has built a more precise picture of how that worked. In every town along the Nile in Upper Egypt (the south) buildings crowd the river. This scene is from Edfu. Shops at Edfu in Upper Egypt. Photo by Ferrell Jenkins. Early in the month we noted a few things about the late Bargil Pixner and his book on the Fifth Gospel here. We have more comments on these post coming from friends via personal Email than via the Comments feature. These are always appreciated, either way. This helpful note came from Linda Rowlett. I bought the book The Fifth Gospel when we were in Israel. Last night I saw an hour long film on PBS about it showing lots of the places we saw as well as some new things. It had [Bargil] Pixner explaining some of his ideas. If you have not seen it there is a trailer you can view at this site. It was wonderful to see so much around Galilee again and brought back lots of good memories of our trip and that beautiful area. His explanations about the land, the sea, the fishing, etc. were really interesting. See the brief trailer here. I checked the PBS web site and found no reference to this program. It may have been a local presentation in Linda’s area. 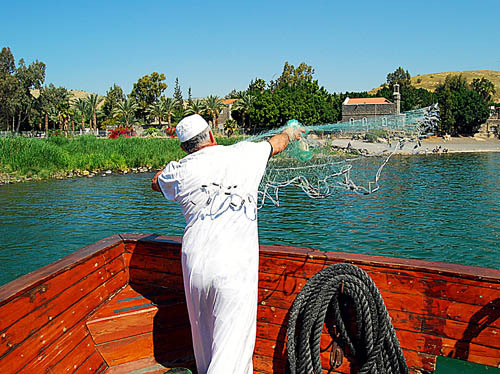 Our photo shows a modern fisherman casting a net in the vicinity of Tabgha. The dark colored building, made of local basalt, on the shore is designated by Roman Catholics as the Church of the Primary (more about that later). A modern fisherman on the Sea of Galilee. Photo by Ferrell Jenkins.